The Philippine Atmospheric, Geophysical and Astronomical Services Administration (PAGASA) stated in a news conference that the said typhoon would make landfall in Eastern Visayas on Sunday. The cyclone will be named “Ruby” once it enters the Philippine area of responsibility with the international name “Hagupit,” Filipino for lash. It was mentioned that it would further intensify with sustained winds of up to 175 kilometers per hour, along with it, dumping intense rains and whipping up waves capable of sending up to four-meter storm surge. However, a typhoon shall only be considered a supertyphoon when it reaches 220 kph of sustained winds. According to senior weather forecaster for PAGASA Rene Paciente, despite not yet being a supertyphoon, winds howling at 175 kph are more than enough to blow away roofs, toppling trees, electric posts and even cell site steel towers, and destroying houses and other structures made of light materials. Director of Project NOAH, Nationwide Operational Assessment of Hazards, Mahar Lagmay said that they will be issuing storm surge warnings with a clearer forecast by Friday or 48 hours before the estimated time of landfall. Lagmay also added that they would be able to show not only the height of the waves but also how far inland the flooding would reach. The typhoon would cover Southern Luzon, the Visayas and northern Mindanao with a 600-km radius, according to PAGASA. Paciente also stated that the typhoon’s effect would begin to be felt on Friday, the time by which PAGASA will be able to get a better forecast of its strength and track. It is definitely possible that the Eastern Visayas, the region most devastated November last year by the strongest recorded typhoon in history to ever make landfall, would once again bear another typhoon’s fury. Paciente added that there is also a possibility of the typhoon heading northward towards Japan. He said that there is another possibility of the typhoon making landfall in Bicol or in north-eastern Mindanao. 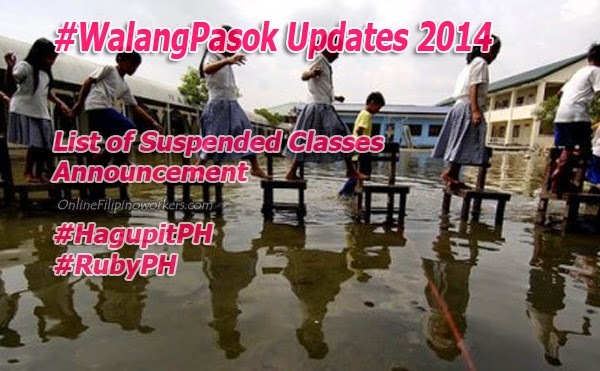 Meanwhile Deped already announced the schools and provinces who suspended their classes due to typhoon Hagupit. UPDATING....* you can reload this page for new updates. 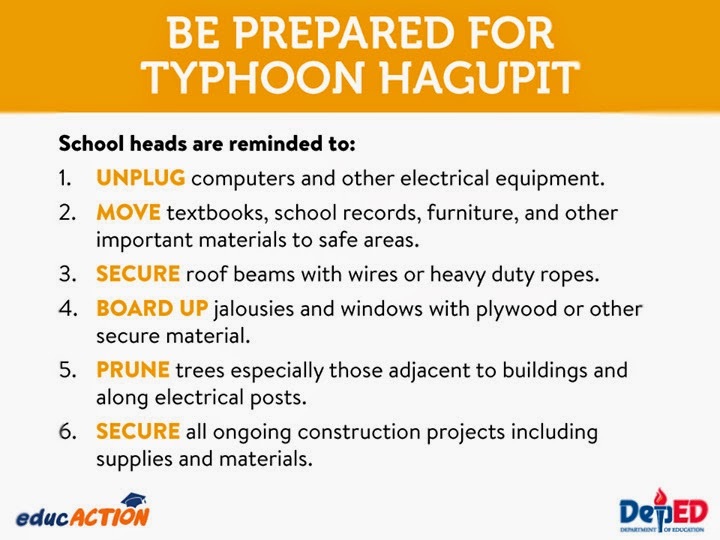 Deped also released preparedness infographics for citizens. The storm is currently about 2,000 km away from Mindanao as it continues to intensify its winds to up to 90 kph as it travels over the Pacific Ocean at 35 kilometers per hour.